My thanks to Jennifer... who gave me this recipe.... 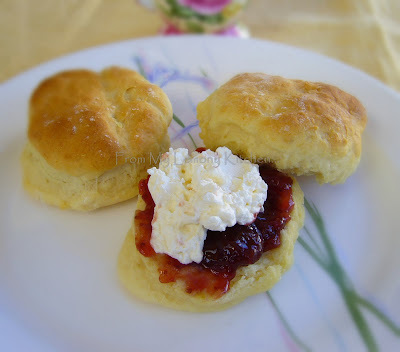 I love scones... but my scones has never been up to the mark!! Even Mr H passed some good comments this time... he is not a 'scones' person... and to get 'praises' from him...hmmm must be really really good!!!! Sift the flour into a mixing bowl. Make a well in the centre. Pour in the cream and lemonade. Add a pinch of salt. Use a knife to mix the ingredients. Turn the mix unto a lightly floured surface. And knead lightly. Do not over knead. Cut into rounds and place them unto a baking tray. Bake at 220C for 10-12 minutes or till golden brown. Serve with strawberry jam and cream.